UPDATE February 9, 2015: The multimedia story is now also available in Polish language. 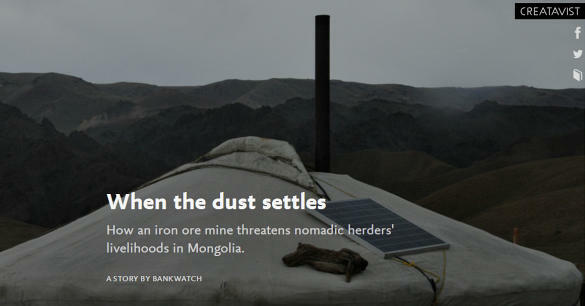 Whether it is animals getting sick of road dust, the loss of winter camps or the loss of access to water, the Tayan Nuur iron ore mine, owned by the Mongolian company Altain Khuder, has brought severe challenges to nomadic herder families in the Gobi Altai mountains. If you haven’t done so, you can read and watch our multimedia story “When the dust settles” to see herders explain the problems they have since the mine came. 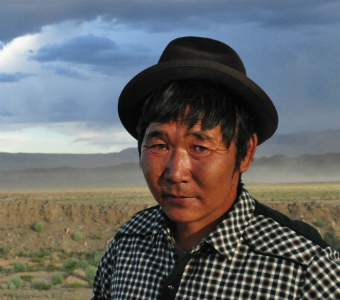 The story is one of the products from a fact-finding mission to the Gobi Altai mountains earlier this year that we did together with researchers from the Centre for Research on Multinational Corporations (SOMO, the Netherlands) and OT Watch (Mongolia). While impacts on local communities are not a novelty in the mining business, Altain Khuder might be a particular case due to its source of financing and its overly hostile approach to dealing with complaints. Altain Khuder is financed by the European Bank for Reconstruction and Development (EBRD), a publicly owned financial institution that – at least on paper – requires its clients to implement certain social and environmental standards. So far, however, it is questionable if Altain Khuder is adhering to these standards. Responding to a draft version of our fact-finding mission report (pdf) that we launched today the company informed us that third party checks certify that dust pollution is within limits and that an assessment done by a company-hired consultant concluded that resettlement did not lead to any loss of herders’ assets. Unfortunately, herders have neither seen the pollution test results, nor do they have any recollection of their assets being assessed. Instead, when trying to raise their concerns with Altain Khuder, the herders faced pressure and intimidation by the company. When we get close to there [the mine] looking for our lost animals, the company’s security would chase after us, interrogate us and treat us as if we were thieves. Worse still, when people complained about the pollution from the mine, Altain Khuder did not hesitate to file lawsuits against altogether 8 people, claiming they defamed Altain Khuder with the intention to cause damage to the company’s business. The cases continued up to one year during which the locals who were charged had to travel several times the more than 1000 km to Ulaanbaatar, each time leaving their work behind. After causing a tremendous amount of burden the cases were finally dismissed. 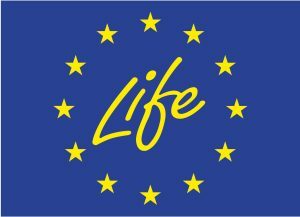 Altain Khuder received financing of up to USD 55 million (EUR 44 million) from the European Bank for Reconstruction and Development. The EBRD likes to claim that by being involved in projects like these, it can help protect the livelihoods of the affected communities. In many cases, however, the EBRD fails to effectively enforce its standards and it is up to civil society organisations and the affected communities themselves to protect their rights, even in the face of intimidation. To do its job properly, at the very least, the EBRD has to better monitor Altain Khuder and make sure that it complies with the bank’s policies. 1. The EBRD-financing includes equity financing of up to USD 25 million and debt financing of up to USD 30 million.